These exceptional illuminating gloves are suitable for either party, disco, festivals and other events. Course can be donated as a special gift. 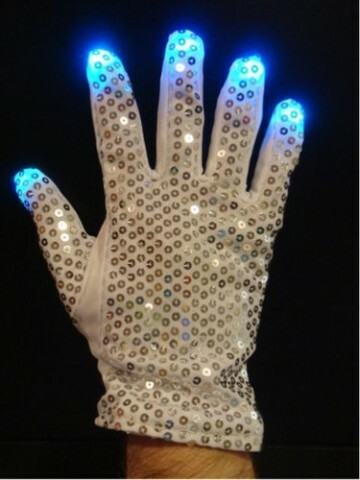 Be cool and you obtain these LED gloves. 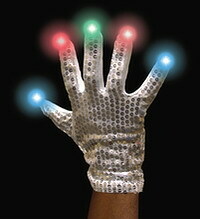 Each finger of the glove can shine in different colors RGB scale - red, blue, green. You can also control whether the glove blink faster or slower. still shine - you can choose up to 7 flashing modes. Gloves are a universal fit for all sizes (except for very large hands), are made of cotton and elastic material that you feel in them the most comfortable possible. 7 possible lighting settings: fast blink, slow blink, permanent lighting and other .. Note: Due to electronic components can not wash gloves. Not suitable for children under 10 years.